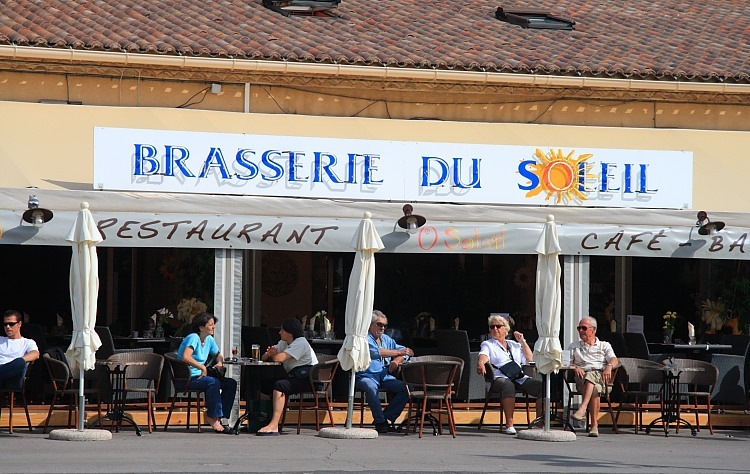 Yes, ‘t was Carol’s birthday and one of the main reasons for our heading this way at this time was to have a birthday lunch at one of the most enjoyable seafood eateries overlooking Marseillan harbour. Last time we tried it, we went for an evening meal around the harbour and it was somewhat disappointing. Things just seem more relaxed at lunchtime so we’ve given up eating out in the evening in favour of relaxing chez Billy. As a bonus this year, we were graced by having Steve and Rosemary for company. Party! 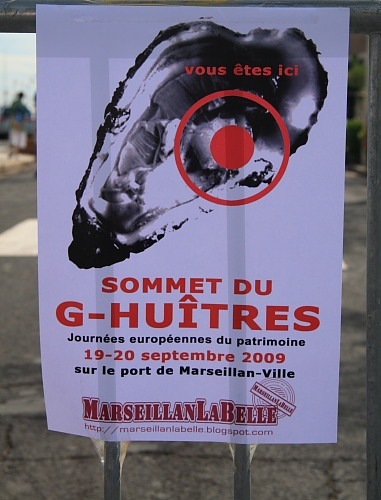 An event was happening, or getting ready to happen, in Marseillan. Having parked and walked down to the main street we heard music and revelry. Well, I say “music”: raucous, somewhat coordinated noises were emanating from several brass instruments and drums. 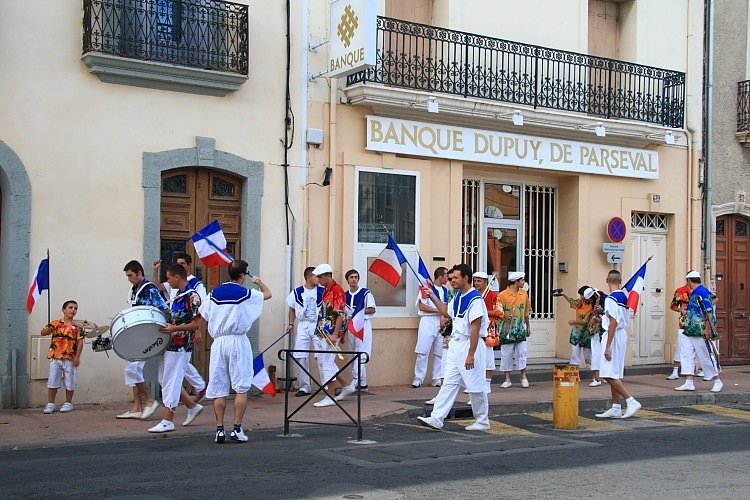 Nonetheless it was all very colourful and jolly and the “band” soon began heading towards the harbour. We followed. The event turned out to be a weekend sort of oyster festival but, as yet, little was happening, other than the “musicians”, that is, who quite by chance launched into a rendition of “happy birthday to you”, at one point. We sauntered around studying the sights before heading for our preferred lunchtime café/restaurant. As we stood surveying the free tables one of the establishments younger patrons in a pushchair and wearing a nappy began to squeal. Mother attended. The squealing continued. Maybe it was upset by the pipe smoke of one of the older customers on the neighbouring table. The noise and smoke pollution were sufficient to make us perform a swift U-turn to choose an alternative, more relaxing venue. Good choice. Birthday girl and Rosemary both enjoyed grilled gambas with pastis while Steve and I both destroyed and impressive plateau de fruits de mer. Other than Steve, who had graciously offered to drive, everything was washed down with a very good local white wine, Picpoul de Pinet.